Are We Done With April Snow? Are we done with the snow? Chances are, yes! The 10-day forecast takes us out through April 18. Temperatures will likely climb into the 50s by Wednesday and stay there through the following Wednesday. Sixty-degree warmth is also possible during this stretch! Currently, the average temperature in Boston for the month of April is 3.3 degrees below normal. Is there an outside chance we could see snow AFTER April 18? There IS a chance, but it is pretty unlikely. For example, in 1938, snow was recorded in May! Boston picked up 0.9 inches of snow for the month. Official weather data collection started in the late 1800s in Boston. However, 1816 was the year without a summer. It has been reported that snow flurries were observed on June 7, 1816. It took a major volcanic eruption to cause snow in June! The next 10 days will remain fairly unsettled. Shower chances are possible most days. On Tuesday, a warm front will be lifting through the region. Showers are possible during the day. Wednesday will likely be dry, but showers are likely from Thursday all the way through Marathon Monday. The heaviest rain of the stretch may coincide with the marathon, but hopefully it will hold off until Monday afternoon or evening. The following Tuesday and Wednesday appear to be dry. 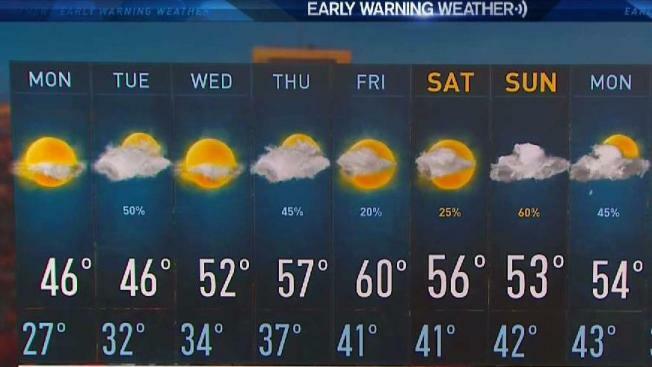 We’re expecting mostly sunny skies and temperatures in the 50s both days. It’s hard to imagine that parts of New England climbed into the 80s in February (even at the coast, we experienced back-to-back days in the 70s) – fast-forward to April, it’s been a challenge getting out of the 40s.